Marlen Urostomy Pouches are proving increasingly popular with customers because of the comfort, flexibility and security offered by this international favorite. The unique push-pull drain tap allows for very simple emptying and is widely acclaimed by users in many countries. Once again the proprietary AquaTack™ delivers the skin fitting and with most needs met by customization of the cut to fit base, we really do have a winner here. "Free-flow" stem allows unobstructed flow of urine flow into leg or night bags, even if pouch twists. 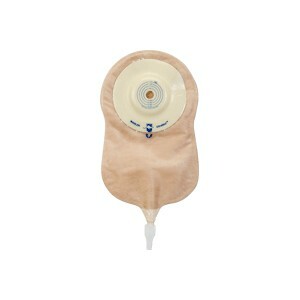 "Push-Pull" E-Z Drain Valve is permanently sealed to the pouch - no wet fingers when emptying pouch. Advantages of a one-piece system. Ease of a disposable system. Quiet, Built-in comfort cover facing the body. Leak-proof for added protection and security.